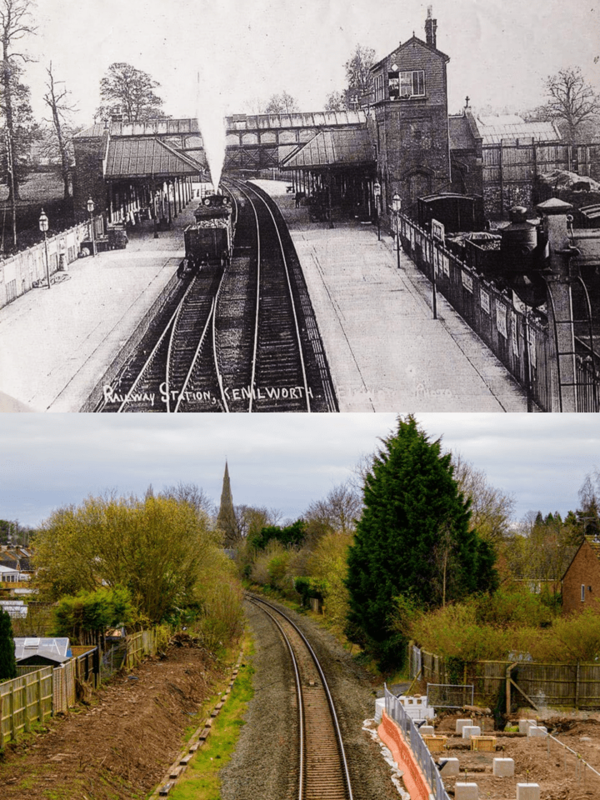 This is a timely Then & Now pairing, insofar as Kenilworth, which has been without a station since the old station was shut in the 1960s, is at last making visible progress in building a replacement. Both stations are visible in the Then & Now scenes above, taken from the Priory Road footbridge. The curve of the track is immediately recognisable in both images and you can just about make out the distant spire of St John’s church behind the plume of steam in the old postcard scene. The old station goods yard is also visible on the right of the ‘then’ image, a plot of land which will yet play a part in the next chapter of Kenilworth Station. As the post-War austerity began to at last to ease in the 1960s, the people of Britain found themselves with more disposable income. One of the manifestations of this was the availability of affordable, mass manufactured cars to people on more modest incomes, where once a car had been an expensive luxury item available only to the wealthy. The government of Harold ‘Never Had it So Good’ McMillan had given Dr Beeching the remit of trimming back Britain’s sprawling and inefficient Victorian rail network and his reports of 1963 and 1965 detailed which stations and branch lines were to close. Kenilworth Station was just one of over two thousand stations on the list. The station pictured in the ‘then’ picture was actually Kenilworth’s second station building, opened in 1883, the first having been dismantled and moved to a spot on Station Road behind The Kings Arms & Castle, later to become The Vaults bar. A detailed account of the coming of the railway to Kenilworth, itself a timely read due to the impending arrival of HS2 on our doorstep, and the development of the two station buildings can be found in Robin Leach’s book Kenilworth’s Railway Age (Odibourne Press, 1995). The Kenilworth Fire Brigade attended a fire at the railway station in April 1923 when the booking hall and station records were destroyed. Harry Sunley tells us in A Kenilworth Chronology (Odibourne Press, 1995) that the last passenger train pulled into Kenilworth on 16th January 1965 and the Kenilworth to Berkswell branch closed the following year. The first steps to demolish the station were taken in 1969, and although passenger services on the line resumed in 1977 no steps to reinstate the station looked likely to be taken. Robin Leach’s book also contains a heartfelt account of the demolition of the structure of the main station building, which was not undertaken in earnest until 1983 when the booking hall and waiting rooms were finally demolished. By 1985 nothing was left at all. The site is now occupied by houses, visible on the extreme right in the ‘now’ image. Despite countless promises of a new station for Kenilworth coming to nothing over the years, there are, at the time of writing, very visible signs of actual building work on a site next door to the original. The ‘now’ photo above shows the footings for the platforms for the new station being laid, so close to the original site that the new platforms will in fact overlap the old. The design of the new station building was voted on by members of the public, who chose a design that somewhat mimics the look of the original. The new Kenilworth Station is due to open on the site of the old station’s goods yard on 10th December 2017, according to current estimates. Thanks to Liam Belgrove who submitted the ‘then’ picture via Facebook.